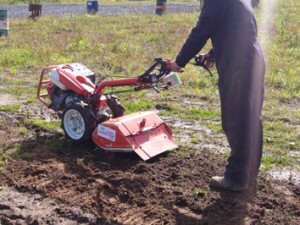 Rotavators are powerful pieces of equipment designed to break up, churn and aerate soil. Rotavators use specially designed blades or rotors which spin to break up the soil. Many gardeners and landscapers will use Rotavators to improve drainage within the soil whilst levelling the area at the same time. This makes for an ideal area for laying turf or an area for growing vegetables and crops. Preparing your plot for a Rotavator? Before you begin to use a Rotavator on your piece of land you will need to take into consideration the level of moisture in the soil, especially if the soil is compacted or if it has not been cultivated before. Clay soils in particular behave differently to when they are wet to when they are dry. When clay soil is dry it becomes very hard and Rotavator will only be able to scrape away the very top surface of the soil. If the soil is too wet, the soil forms clods when using a Rotavator. The clods then become like small rocks when they dry out. To prepare the area of land that you want to use the Rotavator on, you will need to water the area for a few hours, three to four days prior to using the Rotavator. You can check to see if the water has drained enough for you to begin using the Rotavator by making a six inch deep hole and picking up a handful of soil from the bottom and then squeezing it into a ball. The soil you have just picked up should be easy to break using just one finger. If the soil indents rather than breaking the soil isn’t quite dry enough. Keep checking until the soil breaks easily. You will also need to ensure that you have completely removed any weeds from your area. If you use the Rotavator through an area where weeds are prominent, they can often get caught up on the Rotavators blades and spread across your plot, creating an even bigger weed problem. 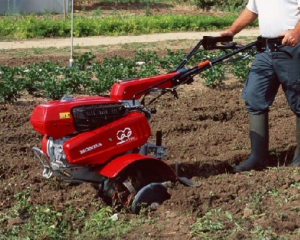 Rotavatos are powerful pieces of gardening equipment and should be used with the utmost care. Ensure that you keep your feet and hands away from the rotators at all times. 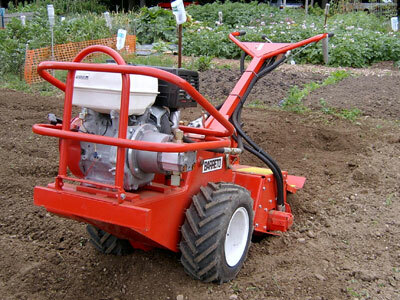 Take your time when using the Rotavator, allowing you to be in control at all times. Ideally use ear defenders and padded gloves for added protection. Rotavators will buck and gyrate whilst moving over the soil, so try to stay relaxed and avoid tensing up as this can cause muscular injuries. Rotavate your area of land in strips, overlapping slightly with a previous strip as you move over the area. Go over your stops two to three times, continue to repeat the process at right angles to your original strips. Avoid digging down more than 2-3 inches deep on the first pass, then set the Rotavator to dig deeper after each time you pass over a strip. Keep an eye on our blog for more up to date gardening how to’s and turf tips to help you in your garden. This entry was posted in How To:. Bookmark the permalink.